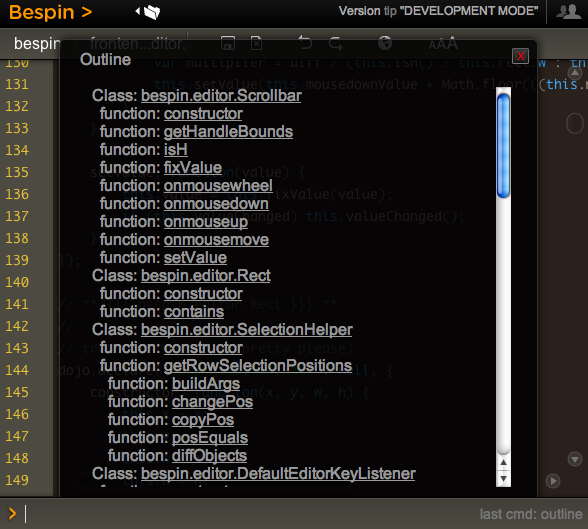 Bespin Concept Defrag Command; Exploring some fun visualizations Google App Engine and The Java Web; The Wrong Java? WebKit recently released the ability to style scrollbars in HTML elements (but not the main window, which you have been able to do in IE for donkeys years much to many peoples chagrin). Holy pseudo classes batman! To be fair, this is partly due to the example page having many types of scrollbars in one (hence the not this and not that but the other) but there are still nested classes that you need to grok to get this going. I quickly built a debug scrollbar where I styled the various pieces with simple colors and borders so I can see which was which. I also went about making the scrollbar have one up arrow on top, and one down arrow on the bottom. John Resig has a nice readable post on border-image. And, there you have it. Now we can have nice Bespin-y scrollbars throughout Bespin. This may not be complete though, as we have the ability to also tie in :active and :hover work if we wish (change the color when selecting etc). Of course, many people had “custom scrollbars”. There are plenty of comments on the original Surfin’ Safari post, and various rants about Flash versions. I agree that we have all seen bizarre Flash versions of scrollbars that don’t look like them at all, and where the designer didn’t bother to put in support for the mousescroll ability etc, but this is a bit different. It let’s you merge in your look and feel, yet with native scrollbar functionality. And, with Google recreating the button maybe we can feel a little bit better about tweaking the look of common UI elements as long as they are familiar enough to users to still make natural sense. Now, the CSS declarative way to do scrollbars seems to get pretty ugly to me with all of he pseudo classes and various magic to get the functionality that you would like. I have to admit to liking Kevin’s demo of Flash Catalyst at Web 2.0 Expo and how it lets designers build out a scrollbar. We should be inspired to do tools like this. 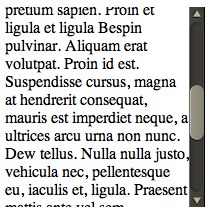 What if we had an API that wasn’t CSS, but let us say: “I want a Mac style double on the bottom button scrollbar. And, here is a thumb, here is a track, go for it”. That being said, at least we do have the ability to do this kind of thing now. I hope that other browsers follow WebKit in this instance. Personally I find Google’s reskinned buttons annoying. Firefox goes out of its way to render buttons the way your OS intends, and they throw all that away? Similarly, I don’t personally like reskinned scrollbars. This is what user styles are for? I like having the developer able to do what he feels is best, and then having the user, who knows best how HE feels, to be able to override anything. 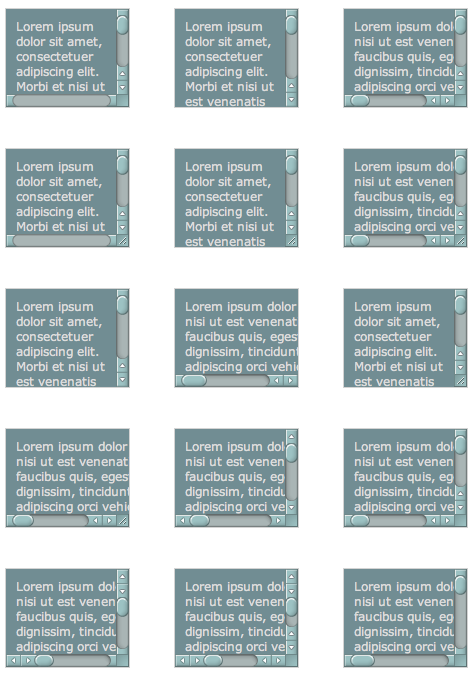 I can see how custom scrollbars are a controversial topic, but I think they’re well worth it. Browser default bars are extremely intrusive, especially when used with overflow:auto for web apps. I often end up resorting to a jQuery plugin. For instance, see this page recently completed: http://www.upenn.edu/curf/fellowships/fellowships-directory – The overflow section helps simplify the page design, by providing a scrollable list, but a default scroll bar would have totally interrupted the page flow. Really great! When you run chrome as an application, its like its own custom program… amazing! I would love you to add a broken down version for the bottom scroll bars as I’ve added your example to a web app we’ve been working on, and if you resize your chrome window you start getting crazy looking colors on the bottom of the screen. I might do it myself and I’ll link it back here if / when it’s done. Can it put in the left not in the right like the default one ?? Is there a way to make this work in other browsers than Safari? I have been using this on one of our chrome only SAAS’s, and noticed recently that the actual draggable / scrollable part of the scroll bar has been warped and is now a little thinner? Any thoughts? Glad I stumbled across this site, been looking for a way to modify the standard CSS overflow scrollbar and will be trying this out on our newest build – will let you know how we get on! Got the three part thumb to work. The trick is the background-clip property. 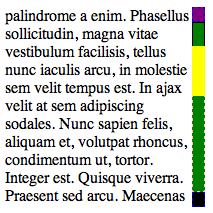 You set a transparent background (or padding, if you prefer [both work]) to the height of one of the end caps, and set their position as appropriate; no-repeat. The real trick is the center piece. For the center piece, you set background-clip:content-box; the end caps are set to background-clip:border-box (or padding-box if you used padding for spacing). This way, the size of the box really only controls the size of the center segment… even if size is set to 0, the end caps will still show up. Seems to work pretty flawlessly. Will attempt to paste code, but will probably get code-sniffer-nipped. Didn’t work, unfortunately. I probably need to call the scrollbar somehow, but don’t know how. All I knew how to do was to copypaste all that into style.css. I know how to edit the CSS itself, but I don’t know how to assign that CSS as the scrollbar of a certain div. Thanks a lot .. I try learning CSS gradually and this is a big help for me!